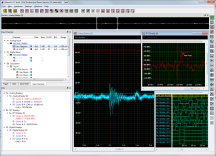 SBench 6 is a powerful and intuitive interactive measurement software. Besides the possibility to commence the measuring task immediately, without programming, SBench 6 combines the setup of hardware, data display, oscilloscope, transient recorder, analyzing functions and export functions under one easy-to-use interface. All current Spectrum cards are supported.